By the time this finally gets put up, it will be a week since I've seen the movie the first time. If you haven't seen it by now, I apologize if there's anything I give away. I feel like there are so many things that I would like to say about the final Harry Potter film that there will probably be points where I ramble in this post, but please, if possible, stick with it and let me know what you thought too. Spoilers Ahead so you might want to Expecto Patronum yourself from them, if you've yet to see the film, that is. Harry Potter & The Deathly Hallows Pt. 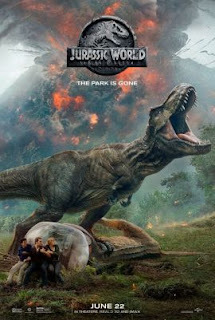 2 released this past weekend (in case you spend your weekends under that boulder I pass on the way home) and including midnight showings and the 3-day weekend box office, it has since grossed more than 168 million dollars. My reason for such a staggering outpouring of support? This is the last time any of us will have a chance to say goodbye to the stories that have shaped our imaginations for more than 10 years and to the pop culture phenomenon that is Harry Potter. For myself, as a fan of the series, this last film was always going to be slightly emotional. In truth, I'm always slightly emotional. Perhaps I should say that it was always going to be a lock that my tears would flow easily down well-worn paths on my cheek. After all, the last book did not cause me to skimp on emotion, so why should the movie? The reality is that "skimp" is never a word that could be associated with the Harry Potter series, so just as with the books, this last film is an all-encompassing look at good v. evil, love and hatred, life and death, darkness and triumph. Now there will always be two types of naysayers to any franchise based on books. There will be those who dislike the books just because of their existence, citing the literature as "rip-offs", "unoriginal", "poorly written" or just plain "too popular". This group of people, in specific reference to Harry Potter, I will never understand. Perhaps my fandom fringes on the fact that I was in the target demographic for the books, perhaps it was the fact that I've always been a fan of anything escapist, perhaps it was the fact that I've always wanted to be British. Who knows? But as a promoter of all things Potter, when these people roll their eyes or huff or scoff or any of those other borderline-insultory verbs, I will always only grant them a baffled look and a silent, judgmental "10 Points to Slytherin". I respect their right to an opinion, but for the love of all that is bright and good in this world, why THAT opinion? However, much like tiny, soulless, doomed baby Voldemort, they are beyond my help. In the second group of bemoaners, there will be those who love the books so much that no visual interpretation will ever please them. Again, for these people, nothing short of a 4 hour version of Harry Potter & The Sorcerer's Stone, complete with what Professor Quirrell had for breakfast would have satiated their intense desire for utter correctness. I'm guessing Quirrell was a Pop-Tart and butterbeer kind of guy, not a Toaster Strudel fan. I mean you have to be on the go if your working for the Dark Lord. For the rest of us, I always have been of the opinion that the books and films should be taken as companion pieces. After all, without the books, the films do not exist, and without the films, the books fail to reach the mass audience that they since have. It's a fact of life. In this social network-saturated world, all things are, inherently, reliant on at least a quasi-symbiotic relationship with the media. The books are where the heart of everything about the stories lie. J.K. Rowling's words open up a world that very few could have ever imagined before, and if they did imagine it, they certainly never described it or ushered us in in such a beautiful way. The books are where WE become a part of the world, but the films are where the world comes to life. Sure we're resigned to spectators for the film, but that's ok, as long as what we've imagined and our own expectations are met. For being responsible for bringing an entirely different world into existence, literally, building from the ground-up, I say kudos to the film production teams for doing just that. Few can argue that anything less than a magical world was brought before our eyes, and if they did argue it, I'm sure I would tune out halfway through their explanation because, doubtless, their opinions wouldn't hold water. It's about time that this production team finally won an Oscar, but like most things American, we're sorely lacking behind the Brits in terms of recognition for the franchise. If any of the films were to do it, though, this should be the one. As a final film, it's a truly wonderful end bow tied around a story that had wrapped (for readers) nearly 4 years ago. And yet, despite the fact that I KNEW what was going to happen, watching it end was still somehow suspenseful and just as equally satisfying as finishing that last page always is. Picking up exactly where Part 1 ends, Dobby has been buried at Shell Cottage and Harry now faces two fronts in his battle against Voldemort. The first is the journey left to him by Dumbledore, the tracking of the Horcruxes; while the second is that of the Deathly Hallows (the invisibility cloak, the resurrection stone and the elder wand) which can only belong to the "master of death". Harry chooses to continue hunting the Horcruxes, leading our main trio on a dangerous journey to the belly of the Gringott's beast, and eventually, out of its high, vaulted ceilings in a roller-coaster of a scene that actually made me think to myself "maybe I should see this in 3D at some point". The second third is a battle royale of sorts, a siege on Hogwarts (an imposing character in and of its castle self) with action sequences that still had me biting my nails and holding my breath. And while all of the explosions and chaos of these scenes could overwhelm the senses, the filming is saved by moments of quiet dignity, and, one of my favorites, the eerily silent run through the front line for Ron, Harry and Hermione on their way to find Lord V.
Snape's backstory, the one that I was just hoping could do such a wonderfully complex character justice, did more than that. This is where my tear ducts really wrestled away control from my hypothalamus and declared victory, to spring non-stop through the rest of the movie. This is what really begins the last, and understandably, most emotional third of the story. This is where we really have to start saying goodbye, for the last and final time. Although Snape's story seems to jump a little quickly for my liking, it is tempered, by one drawn out scene, intermittently cut, of Snape climbing the stairs to Harry's room on that fateful night 17 years ago. The last of this sequence of scenes, with Snape cradling Lily in his arms feels like the reason that the always amazing Alan Rickman was cast so many years ago. It was all building up to his last 5 minutes on screen, and every single second is worth it. To continue on more, about the scene where Harry meets his parents, Sirius and Lupin in the woods, to discuss our collective final encounter with Dumbledore, to have to explain the fact that I really actually like Narcissa Malfoy, to discuss THE KISS, how Neville actually admits to liking Luna, to expound on my revenge-satisfied self at the fate that Bellatrix Lestrange meets (I'll just say that I was thrilled to pieces, and also, that Molly Weasley is BOSS in that scene) would be to give away the joys of the film. Those are the moments we had all been waiting for; those were the moments that fans cheered (literally) at that first midnight showing. I will give away one flat-out spoiler because I can't contain myself. 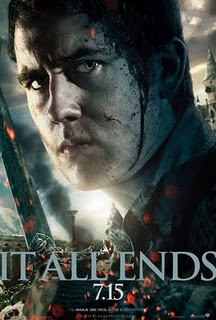 I will never, ever tire of watching Neville Longbottom cut the head off of Nagini, never. Such a suspenseful moment, with such a well-deserved payoff for a character that has gone from beloved goof to hero. Those character journeys are why we read, and those are the journeys that it really does pay to see shown on the big screen. In keeping with the visual tone of the last 3 movies, those since David Yates has taken over, the film has a dreamlike blueish/grayish nature about it, when its at its darkest. This is no longer the golden, bright world filled with just snitches and broomsticks. It's what a world on the brink of devastation should look like, even if watching the stones of Hogwarts crumble hurts somewhere in the middle of your chest. The final film stays as true to the book as it can. It's already been hamstrung by the fact that the series has left some things out in the past, but nothing essential has ever been overlooked. Everything that is at the core of the series and, therefore, at the core of these movies, is there. And as always at its center is Harry, Hermione and Ron. The final shots of its "endings" revolve solely on these three and rightly so. This was always a series about growing up, about the trials you face and about the people who see you through, no matter what. 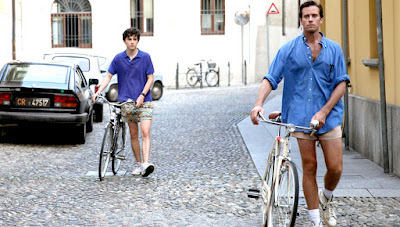 This, like all great series, reiterates one of humanity's greatest lessons: that it's not simply about the family you're born with, it's about the people you choose to be part of your family; that none of us are ever truly alone, as long as we're willing to love and trust in return. In a world brimming with flying cars, snitches, Aurors, and butterbeer, what was always the most important, and what was always the most easily understood to those of us that fell under its spell, is that it was first and foremost, about love, the same decision that Lily had made at the very beginning of Harry's story. Pretty heavy stuff for a supposed kids book, huh? While the bitterness of the end of this series has been moderately tempered (at least for me) by the fact that it has been brought to fruition and met with such a satisfying end on screen (and for available for purchase just in time for Christmas I'm sure), what will stick with me from this last film, even more than any of the scenes that I cheered at, is a scene of such quiet importance that I just can't let it go unrecognized. In what will probably be one of Steve Kloves greatest contributions to the franchise, Dumbledore utters a line which acts as an ode to not just Rowling, but all of those authors who have conjured up worlds that fans live to read, just for the chance to be a part of it: "in my not so humble opinion, words are our most inexhaustible source of magic". And so they are, and always will be. So on my EXTREMELY humble blog, what I'd like to say, in terms of Harry Potter, is thank you. Thank you to J.K. Rowling, thank you to the actors and the directors and screenwriters and the teams that have given me something to look forward to for the last 10 years Beyond that, thank you to all authors for those very precious words. Although it will be tough, this last film has tucked this wonderful franchise in to bed, and now it's time to find another literary adventure. I'd understand if the casual audience member gave it a lower mark, but still, it does stand out as one of the series best, I think.